A County Down priest has stepped down from all ministerial duties pending the outcome of a police investigation, the Catholic Church has said. Police have visited the home of Father John McCallum, the parish priest of Kilcoo, near Castlewellan, and removed computers and financial records for examination. However, the church has stressed that no allegations whatsoever - about financial impropriety or any other issue - have been made against Father McCallum. Parishioners in his parish, which is in the Diocese of Down and Connor, were informed of the development by Bishop Donal McKeown during Mass on Saturday. The church said in a statement: "Bishop McKeown met the priest and the priest has stepped down from all ministry pending the conclusion of that investigation. "Bishop McKeown has informed the parishioners of the position at the vigil Mass in Kilcoo. "Since that police investigation is ongoing, it would be inappropriate for the diocese to make any further comment at this time." 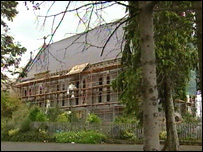 Renovation work costing hundreds of thousands of pounds is being carried out at Kilcoo church. SDLP councillor Peter Fitzpatrick said Father McCallum had been working in the parish for more than a year. "The priests in this parish have always been loved and cherished," he said. "The parish work continues just as normal. "I think it's very important that none of us should jump to conclusions in advance." The police would not comment on the investigation. "The villagers know their priest is under investigation but as yet they don't know what for"